The Sun, one or two naked children (a naked little boy, sometimes riding a white pony or a boy and a girl), sunflowers, often a wall, sometimes a red banner. The Fool wakes at dawn from his long, dark night of the soul to find that the river has deposited him in a serene pool. There is a walled garden around this pond dominated by roses, lilies and splendid, nodding sunflowers. Stepping ashore, he watches the sun rise overhead. The day is clear. A child's laughter attracts his attention and he sees a little boy ride a small white pony into the garden. At one point the Fool stops, blinking up at the Sun so large and golden overhead, and he finds himself smiling, wider and brighter than he has in a very long time. He has been tested and tried, confused and scared, dismayed and amazed. But this is the first time that he has been simply and purely happy. His mind feels illuminated, his soul light and bright as a sunbeam, and it's all thanks to this child with his simple questions, games and songs. This boy has helped the Fool see the world and himself anew. "Who are you?" the Fool asks the child at last. The child smiles at this and seems to shine. And then he grows brighter and brighter until he turns into pure sunlight. "I'm You," the boy's voice says throughout the garden, "The new you." And as the words fill the Fool with warmth and energy, he comes to realize that this garden, the sun above, the child, all exist within him. He has just met his own inner light. The Sun is ruled by...the Sun, of course and as the Moon was your inner darkness, the wild, untamed, unconscious part of you, the Sun is your inner light, civilized and rational, yang to yin, Apollo to Diana. The Sun promises the querent their day in the sun. Glory, triumph, simple pleasures and truths. 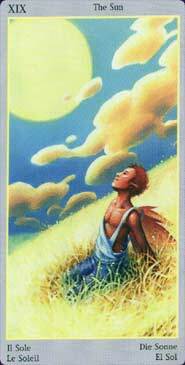 As the moon symbolized inspiration from dreams, this card symbolizes discoveries made wide awake. This is science and math, beautifully constructed music, carefully reasoned philosophy. 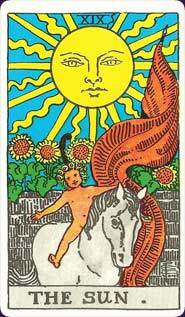 It is a card of intellect and youthful energy. Like the Sun, the querent will likely come across to others as warm and radiant, and they can be told that this is a good time to make decisions and take tests. Standing for another person, this card can indicate those in the querent's life who are the most level headed and sunny. Also the most youthful. And, yes, the child/children in this card can be taken literally if other cards in the spread seem to suggest it. Your querent can be informed that a wanted and most welcome babe will soon be on the way. Likely a boy, or twins. I actually have predicted children with this card once, and once only. Most of the time, however, this card, to me, is all about the Apollian ideal. Young, healthy, new and fresh. Things that were muddled come clear, everything falls into place, and everything seems to go your way. The money you were waiting for arrives, errors in the math are corrected to give you a bit more than expected. The project you've been working on comes out perfectly and you get all the credit. Traffic lights turn green for you, liars come clean and apologize, the garden blooms, the sky is blue, the weather is warm and sweet. Is there another side to this? As with all the cards, there can be. Too much sun can leave you sunburned, which is to say that the card can indicate being too rational and factual, or too optimistic. You may see everything as bright and cheery, ignoring possible shadows. A person can end up fainting from sunstroke because they were too much in the light and heat. For the most part, however, this card echoes the song: "Here comes the Sun...." and absolutely everything is going to be all right. Learn the Sun tarot card meaning and the rest of the card meanings, symbols and stories in our eBook.